You know things are heating up in the Röntgen discography when competing series begin to appear. Such was the case with the Cello Concertos where CPO and Etcetera are slugging it out for market approval – if slugging were not too absurdly pugnacious a concept for this composer. It’s now the case with the violin works. Toccata (TOCC0024) has already released the first volume in its violin-and-piano sequence and now here is CPO’s own inaugural disc. There is overlap. The big Op.40 sonata and the Sonata trilogica are both present in the opening volumes of both series. 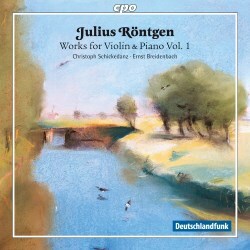 The Op.40 is strongly redolent of Brahms’s Op.78 Violin Sonata though elements of Grieg’s rusticity intrude in the slow movement where the skirling folkloric quotient is quite high. Certain individual elements do emerge, most prominently the clod-hopping peasant dance enshrined in the Scherzo. As admirers of his string trios (vol. 1; vol. 2; vol. 3) will know he had a real affinity for the gently folkloric and he imbeds it here in his violin works from time to time. Though powerfully bathed in Brahms his compositional skill lies in the assimilation. Christoph Schickendanz and Ernst Breidenbach are especially deft in bringing out the sentiment and rich cantilena of the Lento. The other major work is the Sonata trilogica. In the competing Toccata performance harmonic elements sounded almost Delian but in this performance – the work is now dated to 1915 not the earlier accepted misreading of 1925 – that’s less the case. It’s the freest and most modern-sounding of the works in the disc in its fluidity and harmony though it owes an allegiance to Franck. Interestingly he goes in for a trio-less scherzo and ends the sonata with a passacaglia but one bedecked with sweet lyricism and ending in lovely calm. This duo catches, perhaps better than the Toccata pairing, the airy grace of its variation form writing. The two-part Phantasy marries reflectiveness with urgency, basing material on German-sounding folk material. A highpoint is a beautiful lullaby-like passage and the ebullient chase-and-catch incident between the two instruments that ends the first part. The second part is rather too busy to fit the bill as a Phantasy but it’s a work that has its rewarding moments. The Seven Concert Pieces are charming miniatures, little character pieces that embody salon warmth, Chopinesque vitality, lyricism and high spirits. CPO has been sitting on these performances for four years so will have lost some ground to Toccata but better late than never. Where there’s overlap I prefer these performances to those on Toccata.